the great want observed to exist here by many persons who are anxious for the moral and intellectual advancement of this country and felt especially by young men who earnestly desire to keep pace with the march of the mind in our Fatherland, seems to be the absence of those helps and guides, and means of improvement, which seek an apparatus as the present Association is calculated to afford. been asked to take up the work without any reference to the time that he would be able to devote in it, or knowledge of the lines on which the association would be organised. The first time that I meet Mr Davies was at a meeting and when he just put several books on the table with the remark that ‘I thought I would bring these along before I went home’. I concluded that somebody with more time to spare was needed. The ‘somebody’ who had the time and the knowledge, and as importantly the youthful enthusiasm, was Sharp Lewis who became Secretary in July 1855. Lewis’ first-hand knowledge of what was being done ‘at home’ led them to get new premises and to seek to interest prominent people in the work. One such prominent person was its President John Fairfax, who said that the YMCA’s purpose was to ‘furnish moral and intellectual instruction of the young men, and to provide a home and friends for those strangers who landed on these shores destitute of both’. As YMCA secretary, Sharp Lewis explained in the third annual report that the YMCA ‘consists essentially of a band of young men who, having themselves felt the love of Christ, desire to extend the knowledge of Him among their companions and young men generally’. The Association was overtly protestant in orientation having been ‘established on the most catholic principles, comprehending every branch of Protestant Christianity’. It consisted of two groups of men, those who ‘give reason to believe that they are truly converted men’ and those who, ‘Christian or not’, subscribe to the reading room. The subscribers could also attend the various ‘self-improvement’ classes on subjects such as elocution, French, photography and Latin as well as lectures on subjects as diverse as ‘the claims of Christianity’ and Geology. 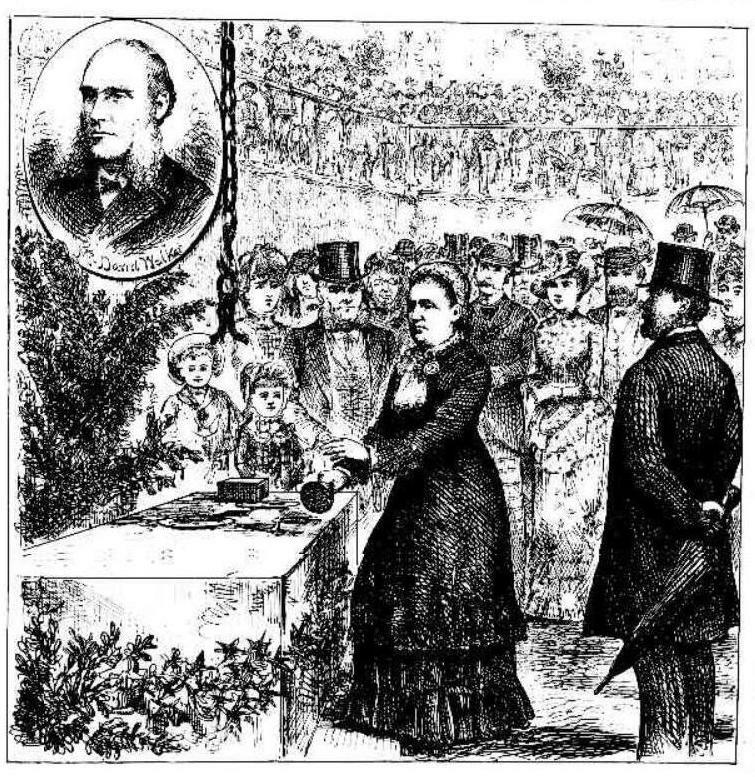 Mrs Margaret Hampson, lady evangelist, laying the foundation stone of the YMCA building in 1883. The inset is David Walker. end of that year, however, it was noted ominously that ‘the society had worked well and had produced much good; but continuous exertion was strenuously urged in order to make the society thoroughly efficient and self-supporting’. It was noted that ‘as usual the burden falls on the few willing ones, and such men as Lewis have been the mainspring of its existence’. By August 1861, the movement had waned and closed its rooms in George Street and by 1863 the YMCA was virtually defunct. Its library of some 1,700 books, many of a self-improving nature, was sold. The residual funds of the Association were held by its Trustees in the hope that meetings might commence once again. While large meetings were not held at this time nor public lectures given as before, the embers of the work remained. The young men who had originally formed the association, such as Benjamin Short, Walter Buzacott, Sharp Lewis and William F Newman, continued to hold regular monthly morning breakfasts on the last Sunday of the month and by the end of 1869 there were attempts to again revive the work, and the members of the former YMCA agreed to hand over their funds to the new YMCA. The YMCA had continued to hold its usual monthly prayer breakfasts, but in 1870 publically announced its revitalisation by running a bookstall at the Inter-colonial exhibition in Sydney. By January 1871, the YMCA was again seeking rooms to establish its work and in April it held a public lecture given by Rev John Graham on ‘the inspiration of the Holy Scriptures’. A room was secured in the Temperance Hall, Pitt Street, and served as a reading room and meeting place where classes on various subjects were held. The YMCA had survived its near-death experience and once again began to grow. Over the next few years the activities of the YMCA prospered with increased classes, lectures and membership. By 1877, a full-time employee was needed and David Walker was approached. In January of 1878, he became the full-time General Secretary, a position he retained until 1902, and with the guidance of Walker and his energetic endeavours, and with the help of others such as John Kent, the YMCA entered a period of vigorous growth and development. This stabilized the YMCA and allowed it to extend its work until it became an effective and far-reaching Christian ministry which benefitted many young men. G. W. Allen, T. Bardwell, J. Caldwell, J. Cox, P.J. Gordon, S. Goold, D.B. Hughes, F. Longmore, J. Mills, W.S. Moutry, R. Packer, F.W.H. Petrie, J. Rothwell, Dr Smith, Professor of Chemistry, University of Sydney, J.G. Wilson. SMH, January 14, 1854. SMH, December 29, 1920. Sharp Hutchinson Lewis, ‘Journal of a voyage from London to Sydney, New South Wales in the ship Walter Hood, Sproat Commander’ 12 March to 13 June 1854. NSW State Library MLMSS 2368. 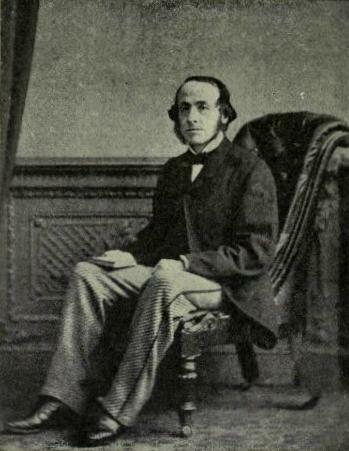 Sharp describes John Joseph Davies (1798-1880) as the brother-in-law of John Robinson. He was in fact the father-in-law as Robinson married Davies’ daughter Margaret Emma Davis in 1837. Lewis has confused JJ Davies with his son JH Davies. Davies was 56 at the time and Lewis was 24. Examiner (Kiama, NSW), October 20, 1860. Sydney Mail, June 6, 1863. Sydney Mail, May 21 1870. Sydney Mail, Nov 19, 1870. Evening News, June 28, 1894. By phinaucohi in Philanthropy on July 25, 2015 .